Analysis: Diggs' eight-yard score in the second quarter raised his season touchdown total to eight, matching last year's career high. 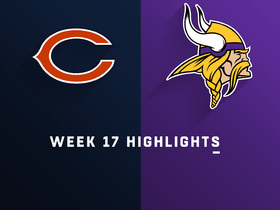 With Minnesota still battling for a playoff spot, Diggs will do his best to further improve on that number in Week 17 against the ferocious Bears defense. 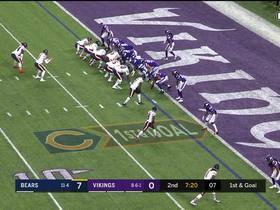 Analysis: Diggs opened the scoring with a 13-yard touchdown just 3:20 into the contest, but he was pretty quiet the rest of the way as quarterback Kirk Cousins threw for just 215 yards. While Diggs has been held below 50 receiving yards twice in the past three games, he preceded this mediocre stretch with 322 yards over the previous three weeks and has four touchdowns over the past six games. Owners who have ridden him this far should continue to stick with Diggs against the Lions in Week 16. 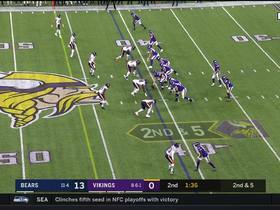 Analysis: Diggs' performance was highlighted by a 48-yard reception during the second half. 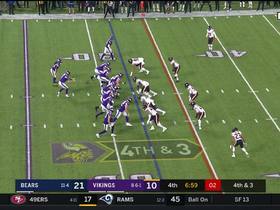 Prior to that, the Vikings offense struggled mightily to move the ball and ultimately didn't muster any points until its final drive. Nonetheless, Diggs ended the evening as Minnesota's leader in the passing game, topping the 75-yard plateau for the fourth time in his last five games despite playing through a lingering knee ailment. The wideout will look to keep his strong stretch going Week 15 versus the Dolphins. Analysis: Diggs has been undergoing regular maintenance-related practice designations since late November and never appeared in any danger of missing Monday's contest. The 25-year-old will aim to build on his 2018 numbers against a Seattle defense that is allowing 250.7 passing yards per game. Analysis: If his practice regimen the last two weeks is any indication, the Vikings may keep Diggs on a maintenance plan as long as he's tending to a knee injury. In the sole game in which he played through the issue, he reeled in five of six targets for 49 yards Week 13 at New England. If Diggs does the same Monday in Seattle, he'll face the league's 19th-ranked pass defense (250.7 yards per game). Diggs (knee) was limited at Thursday's practice, Chris Tomasson of the St. Paul Pioneer Press reports. Diggs (knee) caught all five of his targets for 49 yards during Sunday's 24-10 loss to the Patriots. Analysis: Diggs' availability was in question due to a nagging knee injury, but he progressed well enough during the week to suit up. He clearly wasn't at his best, but he still led the team in receiving yardage, though that was more a reflection of his team's inability to generate much offense through the air. Diggs will have an extra day to recuperate before next Monday's matchup with the Seahawks and should be on track to play, barring any setbacks during the week. Diggs (knee) is active for Sunday's game at New England. Diggs, who is listed as questionable for Sunday's game against the Patriots, had his injured left knee swell overnight and now needs to test it prior to the 4:25 p.m. EST kickoff before it's determined if he'll play, Adam Schefter of ESPN reports. Analysis: Diggs missed the first two days of practice this week before getting on the field Friday, albeit on a limited basis. It looked like he was on track to play as a result, but he now appears to be a true game-time decision. 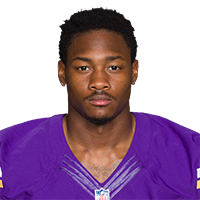 Check Diggs' status when the Vikings release their inactive list 90 minutes prior to kickoff. Diggs (knee), who is listed as questionable for Sunday's game against the Patriots, is expected to play, Adam Schefter of ESPN reports. Analysis: Diggs missed the first two days of practice before getting on the field Friday, albeit on a limited basis. It would be prudent to check back on Diggs' status when the Vikings release their inactive list 90 minutes prior to the 4:25 p.m. EST kickoff, but the wideout shouldn't face any restrictions if he is in fact cleared to play. Diggs (knee), who is listed as questionable for Sunday's game against the Patriots, remains optimistic that he'll be available to play, Ben Goessling of the Minneapolis Star Tribune reports. Diggs (knee) is listed as questionable for Sunday's game in New England, Andrew Krammer of the Minneapolis Star Tribune reports. Analysis: As expected, Diggs gets a questionable tag after returning to practice Friday in what appeared to be a limited capacity. He said he intends to play in the game despite missing practice Wednesday and Thursday, but it's probably best to treat him as a game-time decision ahead of Sunday's 4:25 p.m. EST kickoff. Diggs (knee) is present for practice Friday and wearing a helmet, but doesn't appear to be doing much work, Chris Tomasson of the St. Paul Pioneer Press reports. Analysis: Despite missing practice the previous two days, Diggs said he expects to play Sunday in New England. He did some running Thursday and was then spotted going through individual drills Friday. It's possible he increases his activity level once the session is closed off to the media, but it nonetheless seems likely the wideout will be listed as questionable when the final injury report is released later Friday. Diggs (knee) expects to play in Sunday's game at New England, despite sitting out practice Wednesday and Thursday, Chris Tomasson of the St. Paul Pioneer Press reports. Diggs (knee) isn't participating in Thursday's practice, Andrew Krammer of the Minneapolis Star Tribune reports. Analysis: Diggs was instead relegated to working out on the side while sporting a wrap on the left knee, which he likely tweaked in Sunday's 24-17 win over the Packers. The wideout's lack of involvement in team drills for back-to-back days doesn't offer much confidence about his health heading into the Week 13 tilt with the Patriots. Diggs may need to turn in a full practice Friday to avoid an injury designation heading into the weekend. Diggs was withheld from Wednesday's practice due to a knee injury. Diggs didn't participate in practice Wednesday, Chris Tomasson of the St. Paul Pioneer Press reports. Analysis: Diggs sat out the Vikings' Week 9 game against the Lions due to a rib injury but has otherwise been a beacon of health this season, maintaining weekly offensive snaps counts of roughly 60 per game. He's been targeted 29 times in two games since the aforementioned absence, which has translated to 21 receptions for 203 yards and two touchdowns. Perhaps he's receiving a veteran's day off, but Wednesday's injury report will declare the reason for his lack of activity. Diggs caught eight passes (11 targets) for 77 yards and a touchdown in Sunday's 24-17 win over Green Bay. He added 12 more yards on one carry. Diggs caught 13 passes (18 targets) for 126 yards and a touchdown in Sunday's 25-20 loss to the Bears. Diggs (rib) isn't listed on the Vikings' final injury report for Sunday's game in Chicago. Diggs (rib) practiced fully Wednesday. 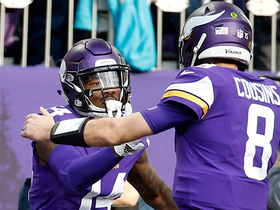 Analysis: Held out of the Vikings' previous game Week 9 against the Lions due to a rib injury, Diggs is healthy on the other side of Minnesota's Week 10 bye. In conjunction with handling every practice rep Wednesday, the wideout told Ian Rapoport of NFL Network that he was confident he "will play" Sunday at Chicago. With his ribs back to 100 percent, Diggs will take aim at a Bears defense that has allowed 8.2 yards per target and eight touchdowns to wide receivers in nine games this season. Diggs (ribs) said he will return for Sunday's game in Chicago, Ian Rapoport of NFL Network reports. 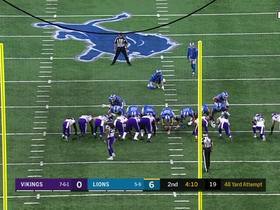 Analysis: Diggs missed Week 9 against the Lions and then got extra rest during a Week 10 bye. After returning to practice Monday without incident, he should be at least a limited participant when the Vikings release their initial injury report Wednesday. Assuming he's able to play, Diggs will face a stout Chicago defense that's allowing just 6.8 yards per pass attempt. Diggs (ribs) remains listed as questionable but isn't expected to play Sunday against the Lions, Adam Schefter of ESPN reports. Analysis: Things always seemed to be trending in this direction after Diggs was deemed a non-participant at all three practices this past week. Final confirmation on his Week 9 status will arrive when the Vikings release their inactive list approximately 90 minutes prior to Sunday's 1 p.m. EST kickoff. It appears as though the team plans to play it safe with Diggs with a Week 10 bye on tap. Diggs (ribs), who is listed as questionable for Sunday's game against the Lions, is considered a "long shot" to play, Ian Rapoport of NFL Network reports. Analysis: Diggs was unable to get on the practice field all week, so it comes as little surprise that he's trending toward sitting out for the first time this season. Assuming Diggs is in fact inactive Sunday, he'll have added time to recover from the injury with the Vikings on bye in Week 10. Diggs (ribs) is listed as a non-participant on the Friday injury report, with a 'questionable' designation for Sunday's game against the Lions, Chris Tomasson of the St. Paul Pioneer Press reports. 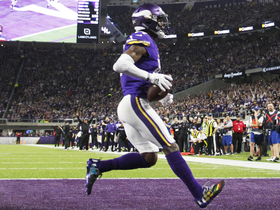 Vikings wideout Aldrick Robinson hinted Friday that Diggs (ribs) isn't expected to play in Sunday's game against the Lions, Andrew Krammer of the Minneapolis Star Tribune reports. "With Stefon out, a lot of guys are going to play more," Robinson said after Friday's practice. "Me, [Laquon Treadwell] and [Brandon Zylstra] -- all of us are going to play more." Diggs (ribs) is listed as questionable for Sunday's game against the Lions. Diggs (ribs) appeared to be limited at Friday's practice, Courtney Cronin of ESPN.com reports. Analysis: Diggs made his first practice appearance of the week, but he then came off the field for the portion open to the media. He'll presumably be no better than questionable when the Vikings release their final injury report for Sunday's home game against the Lions. A Week 9 absence would free up snaps for Laquon Treadwell and Aldrick Robinson, with Kyle Rudolph and Adam Thielen also candidates to take on some of Diggs' usual target volume (10.6 per game). Diggs (ribs) was held out of practice Thursday. Analysis: Per Courtney Cronin of ESPN.com, Diggs wasn't in pads Thursday but threw passes to fellow wide receivers during individual drills. Such activity wasn't enough for the Vikings to bump Diggs to a limited participant, leaving just one more session to make his presence felt this week. Even if he doesn't log a single practice rep, though, he told Chad Graff of The Athletic on Thursday that he "absolutely" expects to suit up Sunday against the Lions. Diggs (ribs) said Thursday that he "absolutely" expects to be active for Sunday's contest against the Lions, Chad Graff of The Athletic reports. Analysis: Diggs was held out of practice Wednesday as a result of a rib injury, but it doesn't seem to be a threat to his gameday availability. How he fares in practice Thursday and Friday will determine whether he's correct with the assessment of his health. 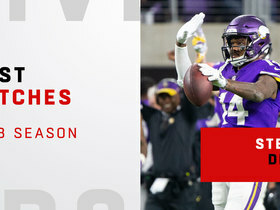 Stefon Diggs posted career highs with 102 catches for 1,021 yards and 9 touchdowns in 2018. Here is a look at his best catches. Minnesota Vikings wide receiver Stefon Diggs catches an 8-yard touchdown pass from quarterback Kirk Cousins. 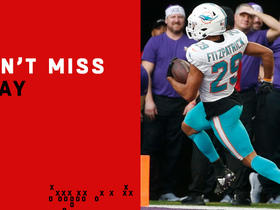 Miami Dolphins rookie safety Minkah Fitzpatick reads Minnesota Vikings quarterback Kirk Cousins pass for his first career pick-six.